Sofa cleaning is one of our chief services and we are very serious about it. Sofa cleaning is a technical procedure which requires sound knowledge and sufficient prior experience in order to yield quality, lasting results you can actually see and feel. Our customers can be sure their delicate sofa materials will be treated properly and with no risk of damage. Each of our sofa cleaning appointments is carried out by specially trained technicians with years of industry experience. They are equipped with professional grade steam and dry cleaning gear in order to perform exceptionally well every time and deliver top notch results when customers need them the most. Our sofa cleaning service is designed with versatility and convenience in mind. The sofa cleaning is done on site, there is no need to take the sofa pieces anywhere as our cleaners will visit you fully equipped and ready for the task at hand. Not having to take the sofa pieces to another location makes the cleaning appointments quick and easy to bear as customers’ schedules and daily commitments will not be disrupted. Our cleaners understand that every piece of furniture is unique and holds much value to its owner so every sofa cleaning job is approached carefully and accordingly. We appreciate the health and wellbeing of our customers, their loved ones and their pets, this is why we use environmentally friendly, non-toxic, biodegradable products and materials which pose no threat to the health of the house occupants. All cleaning materials will evaporate and dissolve shortly after the cleaning has been completed with no trace whatsoever. There will be no nasty after smells or residue on fabrics or surfaces. The sofa cleaning is available as a standalone service or in combination with other types of cleaning for extra value for money and convenience. We can organize the service for any day of the week, there are no extra charges for weekend or public holiday appointments. We can also arrange for flexible appointment hours so call today, receive your free quote and let us worry about your sofa while you kick back. 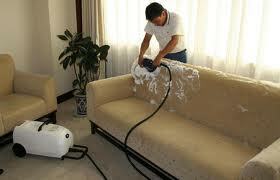 Sofa cleaning is a technical task which requires sufficient prior experience and professional touch. Our cleaning technicians are trained to perform professional grade cleaning on all types of sofas in order to deliver fast and efficient results. Customers can be sure their fine sofa fabrics and finishes are in good hands and will be treated accordingly. The cleaning crews are equipped with modern cleaning equipment and materials which yield exceptional results without risk of damage to sensitive sofa fabrics or finishes. Our sofa cleaning service is designed with flexibility and versatility in mind. The cleaning work is performed on-site, there is no need for customers to disassemble or take the furniture pieces anywhere as our cleaners will come fully equipped and ready to tackle the job on the spot in order to save time, effort and money. Having the sofa cleaning done on-site is another way to streamline the service and make it extra convenient for our customers. The appointment times are kept to a minimum duration in order to avoid disruptions to daily schedules and customer work commitments. We know that time is money and both are hard to save so fast and quality results are top priority for us. We also know that each piece of furniture is unique and holds a certain value to its owner, whether that’s material of sentimental, so our cleaners approach each job with utmost attention and care. The company values the health and wellbeing of its customers and their families so there are no harsh chemicals or toxic substances used to perform the sofa cleaning. There will be no nasty smells or chemical residues on any of the furniture or in the room as all our cleaning materials will dissolve and evaporate shortly after the session has been completed. Our professional sofa cleaning service is available as a standalone order or in combination with another service for added value. The sofa cleaning service runs seven days a week with no extra charges for weekend and public holiday appointments. Ask for your free quote and don’t forget we offer flexible appointment hours too! Sofa sets are valuable pieces of furniture which see a lot of heavy use on a daily basis, you have the kids jumping and rolling around the sofa – with their shoes on, of course, you have the dog or the cat shedding hairs and fur on the couch as a daily duty, you might have spilled a glass of wine or fruit juice on the couch and so on. As you can see professional sofa cleaning is something to be considered as conventional sofa cleaning and washing won’t yield the best possible results and is likely to cost you quite a bit in expensive cleaning materials with dubious quality which can damage your sofa. There are different sofa finishes and each of them requires a unique cleaning approach in order to deliver excellent results with no risk of damage to colours and texture. If you want to take the guess work out of cleaning and be sure that your sofa is in good hands, by all means let us handle the cleaning for you and give you a breather from the many chores. Our specially trained cleaning technicians will review and asses the material and the type of staining sustained by the sofa set. They will apply the most effective and sparing cleaning method suitable for your particular sofa set. Depending on the type of sofa and the level of soiling our technicians might suggest dry cleaning or steam cleaning, we can perform both exceptionally well and with no risk of damage. The cleaning crews will visit you fully equipped and ready for the job, there will be no need to disassemble or move the furniture to another location as all work is done on-site for extra convenience. Our cleaners know each piece of furniture is unique and holds a certain value to its owner, this is why each sofa cleaning session is approached with due care and attention. Our customers’ health and wellbeing is paramount to us therefore we use eco-friendly, non-toxic cleaning materials and equipment which pose no threat to humans and animals living at the property.